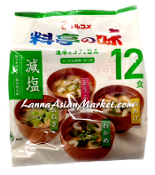 Ingredients: Soup Base Packet: Rice miso, Filttered water, alcohol, sugar, seasalt, soy miso, flavor enhancer, bonito extract, bonito powder, sadine extract, kelp extract. Contains: Soybean, bonito fish, sardine, Scad fish. Ganish Packet: wakame seaweed, dried green onion, flavor enhancer, bonito powder. Fried tofu: dried wakame, dried fried tofu, dried green onion, flavor enhancer, bonito powder. Green onion: Dried green onion, dried wakame seaweed, flavor enhancer. Tofu: Dried wakame seaweed, dried tofu, dried green omion, flavor enhancer, bonito powder.